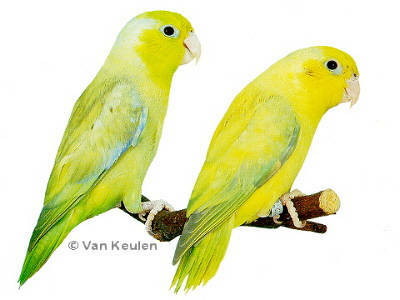 This beautiful mutation, known as the American Yellow Pacific Parrotlet, first occurred in the US in 1989. This is a black-eyed bird with delicate lemon-yellow feathers covering its entire body, and deep flourescent yellow on the facial parts. The yellow changes to a deeper hue after the juvenile molt. American Yellow males maintain a beautiful soft blue on the wings and rump. This mutation must not be confused with the American Yellow. 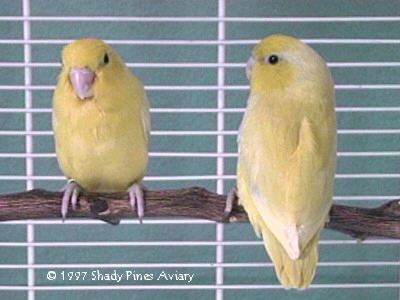 The European Yellow Pacific parrotlet, (also called Pastel) is the yellow form being bred in Europe, which is not as bright and clear. In contrast to the American Yellow, the European Yellow is not a clear yellow. It shows much suffusion of green and the wings are quite spotty giving the bird a somewhat dirty look. 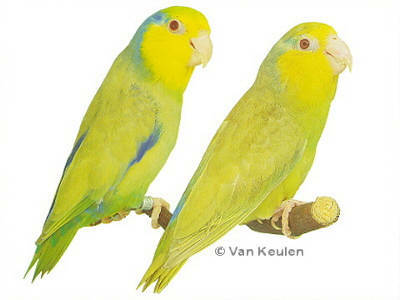 These beautiful blue mutation Pacific Parrotlets first occured in Belgium in 1986. Males of the blue mutation exhibit several different shades of blue. They are mainly a soft powder blue with silvery, grayish-blue wash on the nape and back. The rump, back, and wings are the same deep cobalt blue seen in normal colored males. The face is an almost iridescent turquoise blue. Females of the blue mutation are similar to the male, but lack the cobalt blue rump and wings. Some of the females exhibit a deeper blue on their rump and back due to introduction of the Lucida sub-species. 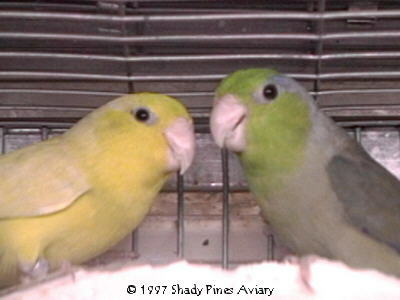 Juveniles of both sexes are a duller blue overall. 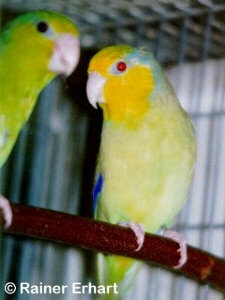 Both the Yellow and Blue mutations are simple recessive, it requires a copy of the same recessive gene from each parent in order for the trait to be expressed in the offspring (visual). If only one copy (ie one parent) of the gene is passed on, the trait would not be expressed (split). 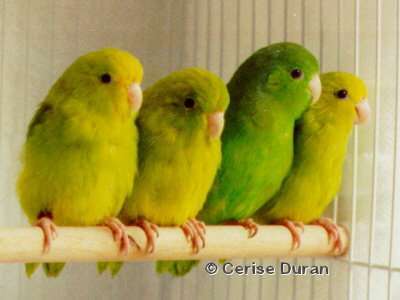 The first color mutation parrotlet to appear in Europe was the Fallow Pacific Parrotlet, a golden green colored bird with bright red eyes. Fallow males have a bright yellow face and all of the cobalt blue markings as their normal colored relatives. 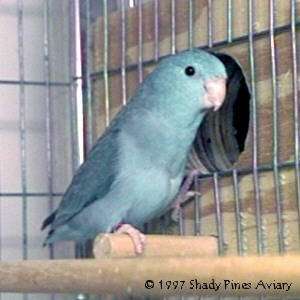 The female is a duller version, lacking the cobalt markings and sometimes having a soft blue rump if bred to the Lucida sub-species. This Fallow mutation is a simple recessive mutation, like the previously mentioned yellows and blues. 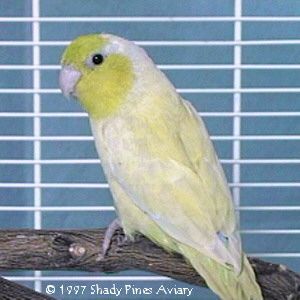 The newest Pacific Parrotlet mutation is the American Dark Factor, an olive green bird with very dark, almost black flight feathers. These birds are darkest as youngsters and seem to lighten somewhat in subsequent molts. 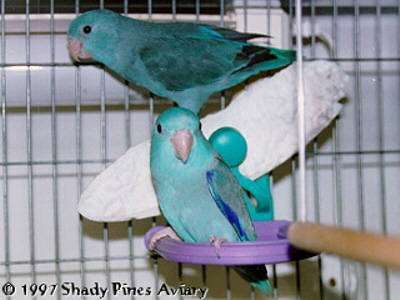 These dark colored birds, when properly bred to the existing blue mutation should produce Cobalt Blue parrotlets. Other combinations could lead to many color mutations, an exciting possiblity. 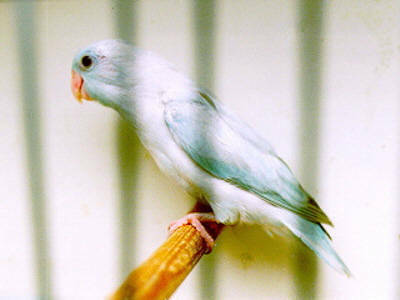 This outstanding White mutation Pacific Parrotlet was produced in Belgium. Although this photo is of poor quality, one can clearly see the soft blue markings on the wings. 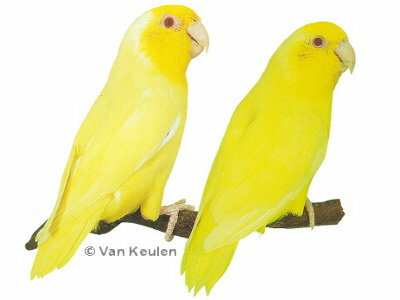 For a White mutation to be produced, both parents must carry the gene for both blue and yellow. This mutation must not be confused with the Albino mutation, which like the Lutino, has red eyes and lacks all blue markings. 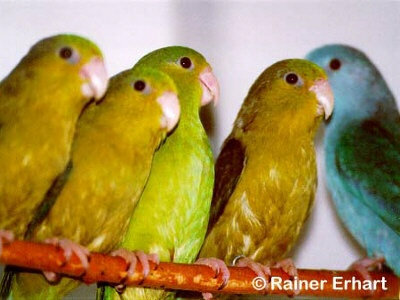 These stunning little jewels appeared in the aviary of Parrotlet breeder Cerise Duran. The offspring of 2 normal colored Green Rumps (F. passerinus deliciosus), these little birds have yellow-green coloring over their body and wings, becoming more yellow on their undersides. This dark eyed mutation, considered a Dilute, is evenly colored with no mottling, beak and feet are of normal coloration. 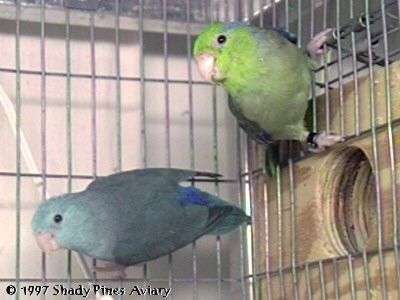 This is believed to be the first mutation of Green Rumped Parrotlets to occur in the US and, like the Pacifics, also appears to be a recessive mutation.